House floor for short-term rents located in the central part of Veliko Tarnovo. The offered foor provides 50 sq.m. living area. It compromises a bedroom, a living room with a kitchenette, a laundry room with washing machine, a bathroom/toilet with hydro massage douche, a corridor. The estate is offered luxury furnished, fully equipped with all appliances. The kitchen has a fridge, an oven, a coffee machine. The living room has TV and H/C air-conditioner. The bedroom is equipped with sheets, blankets, pillows and has a TV. High speed WIFI Internet and TV are provided free of charge. The interior benefits from PVC window frames and MDF doors, laminated and terracotta-tiled floorings and wall-papered walls. The property is set on the 1st floor and has south exposure. 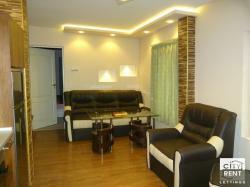 The apartment is a great choice for a comfortable short stay in Veliko Tarnovo. It can accommodate up to 4 people. The location of the residential building provides easy access to all the amenities of the town’s centre as it is close to a park, bus stop, school. Check-in after 14 p.m. Check out - 12 p.m.